(Bloomberg) -- Lori Lightfoot’s sweeping victory on Tuesday did more than give Chicago its first black, female mayor. It delivered an unprecedented mandate -- and sky-high expectations -- for a political newcomer as she confronts the city’s entrenched financial and social problems. She won 74 percent of the vote over Cook County Board President Toni Preckwinkle, rivaling the best mayoral finishes of Chicago’s legendary Daleys. Lightfoot, a former federal prosecutor who also will be the city’s first openly gay mayor, won all 50 wards in the third-most-populous U.S. city. She had never held elective office and will replace Rahm Emanuel, who chose not to run for a third term. Lightfoot will govern alongside a council with new faces. Fifteen aldermanic seats were up for grabs in the runoff, and at least three of the 11 incumbents on the ballot lost to challengers. Alderman Patrick O’Connor, Emanuel’s floor leader, is among those who were ousted. He had also taken over as finance committee chair after Alderman Ed Burke gave up that position once federal prosecutors accused him of an attempted extortion scheme. The historic outcome of Tuesday’s vote was assured after Lightfoot and Preckwinkle, both black women, beat 12 rivals in the campaign’s Feb. 26 first round. The losers included Bill Daley, the son and brother of two past Chicago mayors and, like Emanuel, a chief of staff to former President Barack Obama. Lightfoot, 56, who Emanuel named to a police-reform task force, campaigned as an independent reformer while Preckwinkle, 72, touted her years of experience in elective office, calling the mayoral post not an entry-level job. At a time when Democratic politics is leaning left, Preckwinkle’s establishment resume didn’t sell. In a victory speech that evoked Martin Luther King Jr. and Chicago’s first black mayor -- the late Harold Washington -- Lightfoot said her victory was a “mandate for change.” She pledged to embrace diversity, welcome immigrants, ensure the city doesn’t shrink and combat its infamous political corruption. Referring to President Donald Trump’s immigration policies, Lightfoot decried a “climate of hate and fear” that she said is frightening immigrants from around the globe. In conceding defeat, Preckwinkle noted the historic nature of the night. “Not long ago, two African-American women vying for this position would have been unthinkable,’’ she told supporters. Chicago’s election, while nonpartisan, was fought between Democrats in a place that the party has dominated for decades. Preckwinkle remains the head of the Cook County Democratic organization. In defeating Preckwinkle, Lightfoot inherits control of a city beset by $28 billion in pension debt, a shrinking population and a murder rate far surpassing that of New York and Los Angeles. While Emanuel reassured investors in the city’s junk-rated bonds by boosting taxes, his successor will contend with the pension shortfall and projected budget deficits that threaten the fiscal stability of the city of 2.7 million. “It’s going to take quite a few months to get her arms around the fiscal situation, which is the thing that matters most for investors,” said Triet Nguyen, managing partner at Axios Advisors, a bond research firm, in Lake Forest, Illinois. "On one hand you have optimism but there is a lot of uncertainty that comes with that." Lightfoot’s campaign drew attention for her leadership of an Emanuel-appointed task force that issued a scathing review of the department in the wake of the shooting of an unarmed teenager, Laquan McDonald, by a Chicago policeman. She challenged Emanuel before he dropped his bid for a third term, announcing her candidacy in May. She presented herself as the candidate who would combat Chicago’s notorious reputation for corruption. Indeed, a scandal involving allegations of attempted extortion erupted in the middle of the campaign’s first round. Once a favored candidate, Preckwinkle was hurt by her connection to Burke, who was hit with a federal corruption charge in January. Prosecutors alleged he pressured executives of a fast-food restaurant chain to become clients of his tax-specialty law firm in exchange for a remodeling permit in his ward. Burke has pleaded not guilty. The federal complaint alleges he pressured company executives to donate $10,000 to an unnamed politician, later identified as Preckwinkle. He’d also held a fundraiser for her in his home during her campaign for county office. Preckwinkle, a former Chicago alderman who has led the county government since 2010, also was backed by some of the largest labor groups, including the Chicago teachers union. 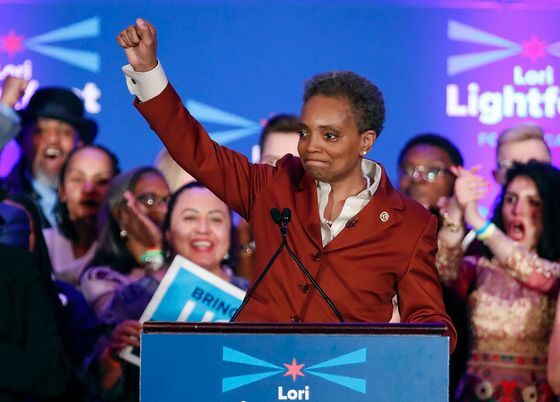 Neither she nor Lightfoot offered many specifics on how to handle the city’s financial problems, but Lightfoot won the endorsement of the local chamber of commerce as well as the Chicago Tribune and Chicago Sun-Times. Under Emanuel, the city ended its so-called scoop and toss, the process of borrowing to pay off maturing debt, and also unwound its debt portfolio of interest-rate swaps. All three major rating companies now have a stable outlook on the city’s debt. Moody’s Investors Service rates the bonds one step below investment grade, while S&P Global Ratings and Fitch Ratings consider Chicago at least one level above junk. Financial hurdles remain. The city’s retirement funds are only 27 percent funded. Emanuel put the pensions on a path to solvency by boosting the city’s contribution and raising property taxes and other fees. After he leaves office, though, the city’s required annual pension payment doubles to more than $2 billion. The next mayor, who will be inaugurated in May, won’t have time to waste once she takes office, said Dora Lee, director of research at Belle Haven Investments, which manages $8.9 billion of municipals including Chicago bonds. The city budget is typically presented in October.